On one occasion in 1984, I resisted the temptation of the devil. 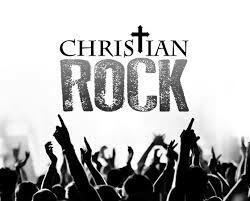 Sometime in late August, TCN Hot Rock premiered a Christian heavy metal band on its radio programme. The deejay stated that the band they were playing called themselves ‘headbangers for the Lord’ and that very much intrigued me. 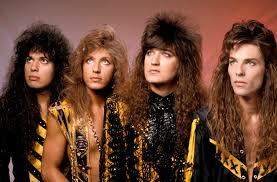 So, on that particular Sunday morning, personal history was made as this was my introduction to the now very famous Christian heavy metal band Stryper. I can’t remember which one of the six songs from their debut EP, “The Yellow and Black Attack” was played on that morning but what I do remember was that I very much liked what I heard. 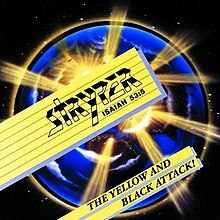 To me, Stryper could hold their own with their secular counter parts in every way. This album has everything a metalhead could ask for. Some crunching power riffs that come through straight away on the opening track and continue all the way to the end. All the vocals on the album were truly amazing and I had a lot of praise for the singer, I didn’t know his name at the time. Of course there was a tight rhythm section but in most cases for me, especially back then was how good the lead guitar was. Well, I don’t think anyone could debate me if I say that Oz Fox belongs up there among his great guitar peers. The best thing about “The Yellow and Black Attack” is that you get all of those ingredients on each one of the six songs on it. One thing I have stated over the past three decades was that with many heavy metal bands, they start out hungry for success and that raw hunger is expressed on their initial demo or even the debut album, some beyond that. That hunger is definitely there on this album. They might have been singing and playing their hearts out here and the result was that the music could be capable of turning stones into bread. The problem Stryper had with both Christian and secular audiences was that no one knew how to take Christian heavy metal. Christians had always branded metal Satanic and some thought that the fusion of Christianity and heavy metal to be sacrilege. As for the heathen, many were put off by the threat of Jesus lyrics. One critic referred to them as “Quiet Riot singing Jesus music.” That’s more of an insult for Stryper than to Quiet Riot. Stryper doesn’t sound like them at all to me. True, Stryper proudly sing about their love for their Saviour but having listened to this band so many times in three decades, I have never found myself wanting to go back to the fold. Personal note: I was a Born Again Christian during my teenage years of the 1970s but all it did for me was mess my head up more than any drugs or music ever could. However, I don’t begrudge anyone who has spiritual beliefs and if they want, I would happily listen to Stryper with them. They didn’t know it back then but Stryper laid down the foundations that built the bridge between the gulf of Christianity and heavy metal with this, their debut EP, “The Yellow and Black Attack.” From here, Stryper would go onto bigger and better things and whether or not you were a Christian or heathen, their music would touch the metal souls of many metalheads. Normally, I don’t write three posts in a week unless in exceptional circumstances which this is. Nothing major, I’m just going to be in Blackpool for the weekend and working a lot next week so I won’t be able to post again until next Friday. However, this doesn’t excuse any of you from your homework assignment from the last post. Only kidding. 1984 was the golden year of heavy metal but it also saw a huge rise in the interest in what has become known as ‘Christian Rock.’ With the onslaught of accusations of rock music being Satanic, Christian youth needed something they could listen to without their beliefs being affected. What emerged was a large number of bands and artists who were Born Again Christians and wanted to use music to spread their word and entertain the flock. I remember back in 1984 a lot of bands of this nature coming on the scene. In fact, early Sunday mornings, my local radio station had a four hour slot called TCN Hot Rock, where they would play music from Christian groups. When I did listen to it, I immediately dismissed the false belief that Christian bands were second rate musicians who were only using religion as a gimmick because they weren’t good enough to make it mainstream. Really, some people actually thought that. No these people could really wail and the music was very good and to shoot down another myth, not all the songs were in your face about Jesus. You’d be surprised how many bands there are who are considered Christian Rock, even some of those who were popular among us heathens. Did you know that three of the four members of U2 were Born Again Christians? 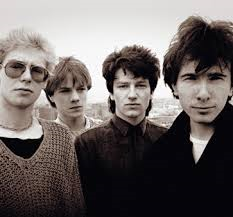 Adam Clayton is the only non believer in the band. Needless to say, their music got a lot of air play on TCN. 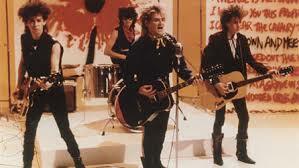 As did another band who I featured here not too long ago, The Alarm. Other artists also came onto my radar thanks to this radio programme, including former Kansas star, Kerry Livgren. I’ll be featuring his album two posts from now. There was Mylon LeFevre, (no relation), Petra, the Daniel Band and it was here that I got my introduction to some heavy metal band called Styper. You might have heard of them. I remember one song getting a lot of airplay on TCN Hot Rock during the summer of 1984 so I thought, I would share it with you. It’s by Steve Taylor and it’s called “We Don’t Need No Color Code.” The song actually is a rant against a supposedly Christian College in the South who was accused of racist practices. Like with everything to do with religion, the concept of Christian Rock is great. Like I said on other blogs, I can listen to Stryper and Mercyful Fate in the same sitting. There are some pretty amazing musicians who are Born Again Christians and I think that’s cool. However, like with everything else, people mess it up and make it look bad. The rise of Christian Rock gave rise to the arrogance in the attitudes of those who listened to it. Some would take this to extremes and if you’ve read “Rock And Roll Children,” (shameless plug), you’ll know what I mean. Next post: Originally, I was going to put a song by the Daniel Band on this post but when I listened to their 1984 album, “Rush Out of the Darkness,” I was so impressed that I’m going to make it my next post. With Christmas rapidly approaching and the radio playing all sorts of Christmas songs from Bing Crosby to Band Aid, it got me thinking (a dangerous thing I know) about the Christmas songs I like. Normally, the ones I prefer are either metalised carols or parodies. I have 2 CDs which contain a lot of both. Now, after putting in a little thought, here are my top ten favourite Christmas songs. 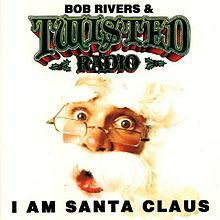 True, Bob Rivers and Twisted Radio features heavy on the list but only two songs are from the above album. Number 8, “Jingle Hell’s Bells” is both a parody and a great rocker in the form of AC/DC. Anyway, those are my top ten Christmas songs and with that, I would like to wish all on here a very Merry Christmas, Happy Holiday and Seasons Greetings.